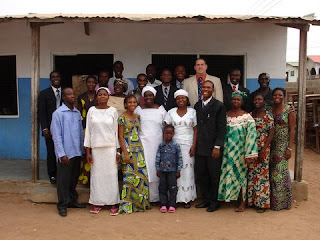 Students in Ghana assisted in a local crusade. 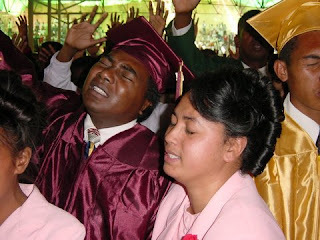 Fifty received the Holy Ghost and another Bible school church plant was established. One received the Spirit in the first service. Student, Brother David became the pastor of Kingdom Gate United Pentecostal Church. Missionary Chris Richardson writes: Bible School students traveled to a city in western Madagascar for an evangelistic weekend. During this revival, there were sixty-five baptized in Jesus' name and fifty-seven filled with the Holy Ghost! A young man named John had been studying to become a doctor. Recently he had suffered a mental breakdown. But during the revival, he received his complete healing, was baptized and filled with the Holy Ghost! Being well known in the community, this was a great testimony of God's healing power and saving grace! 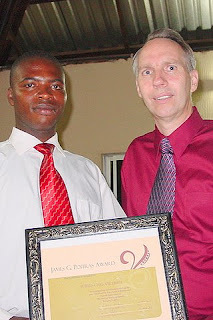 A note from Missionary Gerry McLean: The Bible School graduation was a great success. Nine graduated from the two year program and most of them intend to apply for a ministerial license with the UPCI. At the National Board Meetings, seven new ministers were licensed; five of them were former graduates of the Bible School. One of our 2001 graduates started a church under a tree some years ago. For two years they held services there even in the rainy season. It never rained when they had service during the entire two years! Although there was much opposition to the planting of this church by some local villagers, especially the witch doctor, Brother Rock persevered. He built a building and has over 200 members today. This young pastor, Christopher Rock is now teaching at the Bible school and has already brought three students. Previously, in one mid-week prayer service he baptized thirty-four in Jesus' name and twenty received the Holy Ghost.